On February 27, 1839, an Act was passed by the General Assembly of the State of Illinois creating the present County of Lee from territory theretofore embraced within the boundaries of the County of Ogle. On May 31, 1839, the County seat of Lee County was located at Dixon by commissioners appointed for that purpose. On September 13, 1839, the County Commissioners of Lee County held their first meeting at Dixon, the Commissioners being C. F. Ingalls, Nathan Whitney and James P. Dixon. The plat of the town of Dixon was made by Joseph Crawford, County Surveyor of Lee County, on October 28, 1840, for and at the request of John Dixon, Smith Gilbraith, William Wilkonson, and Bowman & Lane, and recorded in the Recorder's office of said County in Book "A" of Deeds, page 62. On March 20, 1843, an election was held at Dixon on the question as to whether or not a town should be organized under the general statutes of the State of Illinois permitting the organization of towns. The proposition carried, 44 votes being recorded in the affirmative and none in the negative. No record can be found of any of the proceedings that were had under this organization, although it is understood that a village government was conducted thereafter and up to the time of the incorporation of the Town of Dixon by a special act of the General Assembly of the State of Illinois, passed February 10 1853, Section 3 of this Special Act providing, among other things, as follows: "There shall, on the first Monday of March next, and on the first Monday of March annually thereafter, be elected five trustees, who shall hold their offices for one year and until their successors shall be elected and qualified. Public notice of the holding of said first election shall be given by the president and trustees of said town, then in office, as heretofore incorporated." The first record that can now be found concerning the Town of Dixon is that which begins with the election of five trustees under the terms of the Act of February 10, 1853, in force March 1, 1853. This election was held on March 7, 1853, at the court house in Dixon, and John Dixon, P. M. Alexander, Lorenzo Wood, Legrand Wynkoop and A. L. Porter were elected Trustees for the term of one year. These Trustees elected John Dixon as President and A. B. Judd as Clerk of the Board. On February 14, 1857, the General Assembly passed an Act to incorporate the City of Dixon. The Act providing at Section thirteen thereof, that before it should take effect it should be accepted by the qualified electors of the Town of Dixon at an election to be had for the purpose of voting for or against the acceptance. Pursuant thereto an election was had on April 14, 1857, at which 96 votes were cast for the adoption of the charter and 279 votes against its adoption. On February 19, 1859, the General Assembly passed an Act to incorporate the City of Dixon, Section seventeen thereof providing that "This Act is to take effect and be in force from and after its passage." On March 7, 1859, an election was held for the purpose of choosing the first Mayor and City Council of the City of Dixon. John Dement was elected Mayor, but failed to qualify. During the period intervening between the date of the first election and the date set for the election of Mayor to fill this vacancy Joseph Crawford served as acting Mayor. On April 4, 1859, at a special election called for that purpose Amos C. Stedman was elected Mayor and took his seat as such. The Aldermen elected at the first election were: Joseph Crawford, Anson Hoisington, William Peacock, Andrew A. Benjamin, William Barge, William H. Van Epps, Harvey E. Williams and Robert P. Robinson. The City Council appointed James L. Camp, Clerk, and Amos P. Curry, Marshal. The City organization continued under the special charter of 1859 until March 7, 1904, on which date, at an election held for that purpose, it was voted to incorporate under the terms of the general Act of the State of Illinois concerning the incorporation of cities and villages. At this election the number of votes cast "for organization under the general law" was 897 and "against organization under the general law" 489. An attempt was made at an election held in March, 1891, to organize under the general law, but the proposition was defeated, there being 59 votes cast in the affirmative and 663 in the negative. 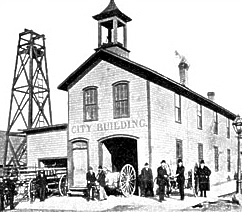 Another election was held January 17, 1911 and, by a vote of 574 to 445, the City of Dixon adopted the Commission form of government. The City has continued to operate under this form since that date although an unsuccessful attempt was made to abandon it at an election held October 22, 1918.